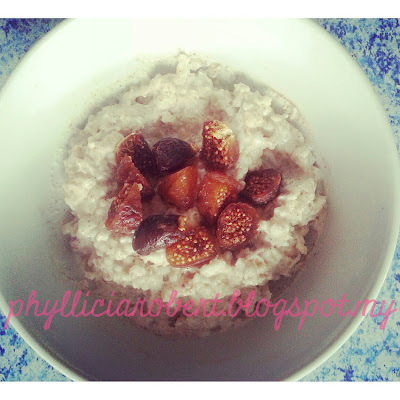 In today's post I would like to share with you my simple recipe for a filling oatmeal breakfast. 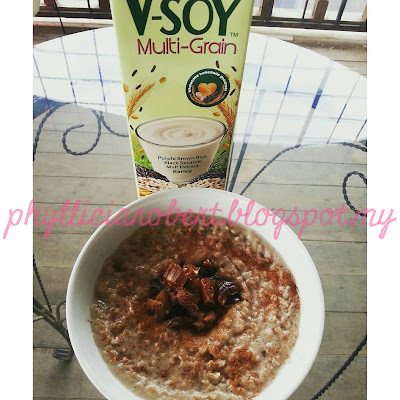 Since there are quite a number of oat varieties in the supermarket, before I get into the recipe let me give you a brief overview on the basic types of oats. Steel-cut Oats - This is the least processed oats among all. The oat groats (whole, unbroken grains of oats which kind of looks like rice) is cut into several pieces. It requires the longest cooking time, about 20 minutes or more. Rolled Oats - Rolled oats are oat groats that have been steamed then rolled and pressed flat. It requires less cooking time than steel-cut oats, about 10-15 minutes. Quick Cook Oats - This variety are rolled oats that have been coarsely chopped to reduce cooking time. Quick cook oats are usually used for baking as well. It requires only 3-5 minutes cooking time. Instant Oats - This is the most processed of the 4 varieties. Oat groats are pre-cooked, dried then rolled and pressed slightly thinner than rolled oats. You only need to add hot water to cook this type of oats. I hope the info above helps you in making your decision on which type of oats to buy according to your needs. While the nutritional value are all the same, fiber-wise steel-cut oats have the highest amount whereas instant oats have the least. Personally I prefer quick cook oats because I can quickly prepare it in the morning for breakfast while still giving me a higher amount of fiber to keep me feeling full until lunch time. I also use it for banana oatmeal breakfast pancakes which I love to make on my days off work. Let's get on to my basic cooked oatmeal recipe shall we? I swear this is so simple that you are probably going to laugh. Hehe..
200ml milk of your choice. 1. Pour milk and oats into a pot and cook on low heat according to the recommended cooking time on the package. Quaker brand quick cook oats only require 3 minutes cooking time. 2. Stir the oats occasionally during the cooking process so that it wont stick to the bottom of the pot. 3. When oats are cooked, turn off the heat and stir in the cinnamon powder. 4. Pour into a bowl and top it up with your choice of chopped fruits. My personal favorites are dates, pineapples, bananas and figs. 1. For crunchy fruits like apples, you can add them to the oats and milk in the beginning of the cooking process. 2. I don't take dairy so I use alternative milk such as soy and coconut. Coconut milk can make the oat porridge super thick so mix 100ml coconut milk with 100ml water to thin it out a bit. 3. Aside from fruits, you can also use nuts and seeds (pumpkin and sun flower seeds are the bomb!) or a combine them all. Your imagination and willingness to experiment is your limit really. What toppings would you have with your oatmeal? Share it in the comments section below. I'd love to hear from you. Until the next post, toodles!